Brand nerd, mom, wife, and trademark attorney, Serena Minott wears many hats and brings 12 years of experience to our South Florida Blogger community. 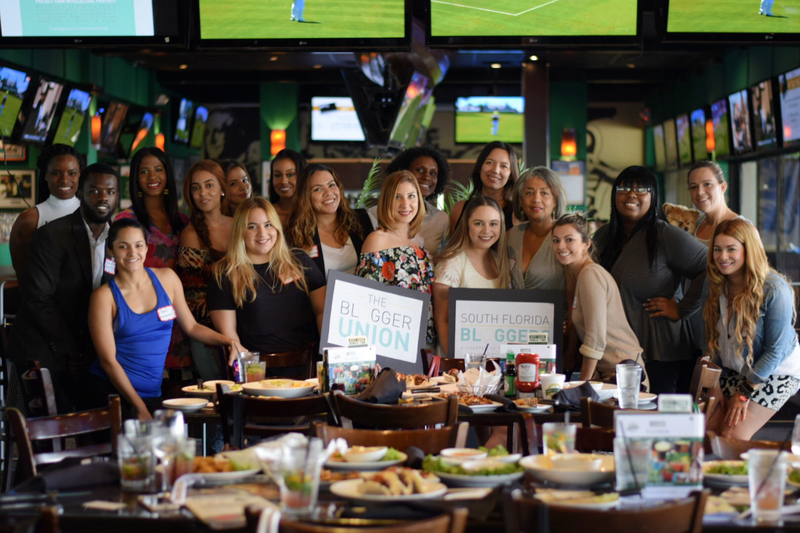 During our June meet-up, Serena helped us answer all of our trademarking questions while bloggers munched on bites from Duffy’s Sports Bar & Grill. If you were hanging with us at the meet-up (and got to enjoy yummy gummy bear martinis), or in case you missed it, we’ve highlighted some key pointers below. How do you pick a strong trademark? This is your mark. You may have gone through a long process of choosing your name, but what will lead you to a strong trademark? Serena explained that a good name is unique and distinctive. It is not too descriptive so as to tell what it is, and it also does not use common words. Some great examples of strong trademarks include Google, Nike and Coca-Cola. Before knowing the brand, these marks do not reveal too much of what they offer. However, you have come to know them well. The same should be true about your trademark. If you do decide to file your mark (and we will get into how Serena recommends you do that below), then you want to make sure it has value. Is your name unheard of? We learned at the June meet-up that a valuable trademark does not include very descriptive words—for instance, Business Consulting Services is too descriptive. When filing for a trademark, you will have to disclaim any descriptive words. Serena taught us how to avoid this! One great tip to get you over this threshold is to add a logo design to your application. How do you start the process of protecting your trademark name? What if you already have a unique mark; what is the next step? Serena recommends starting with a trademark search. This is the first step to find out if you can use your name as your trademark. The trademark office offers a free database for your search called Trademark Electronic Search System (TESS) as a preliminary step. Even though it does not guarantee your name is in the clear, it is definitely worth to search on your own. A second option is to hire an attorney to do it for you. A trademark attorney knows exactly what can trip up your application and will guide you in the right direction. Then ask yourself: what is the likelihood of confusion with another trademark? You have probably heard of Dove chocolate and seen the commercials for Dove soap. So, how is it that you never confuse the two, or how can they have the same name? The distinction is that the two products are in different classes. It is not likely that you will shower with a Dove (chocolate) bar because you can—hopefully—tell the two apart. But, if your mark can be easily confused with another in the same class, then you are likely to be turned down in the application process. What are some options to file to protect your trademark? There are about 45 different classes and what you offer will fall into one of these. As bloggers, there is a classification that covers blogs. That is a great place to start if you are not sure where else you will be taking your blogging. There are two options if you are ready to apply: “In-use” will get you to the end of the line and will start the process. The filing fee is $275 per class that you want protection. Or, you can apply for “Intent use,” which will get you in line before you make a final selection. Serena explained that this secures your place for a later application. You can continue to blog under your name and will have priority over someone else that may file before you. The application process takes about 9-12 months. Someone will be assigned to your file who will ultimately decide yes or no. You can expect to hear back within 4-5 months if there are any issues. The next months might look like back and forth between you and the representative as you work to justify any issues found with your mark. Once your trademark goes through the process, the office will issue you a registration and you are set! Now you have your trademark; are you all done? There are a few pointers that Serena gave the group. For starters, be proactive to protect your brand name so that you maintain your value. One great advice was to create Google alerts for your blog’s name. Even hiring an attorney to be on the lookout for you is a good idea. Then of course, use your mark! There are certain renewal periods throughout the next five to ten years after trademark approval and the office wants to know that you are still in business. We were so fortunate to have Serena share her time and expertise with the group. Truly a kind collaboration, we are here to help each other grow in an atmosphere of community. Whether you are a new blog, or you have a few years of writing under your belt, it is never too early to set a solid foundation. These highlights from the June meeting are a glimpse into the expertise gained. We hope you will join us in a few weeks as we prepare to learn to create stunning pictures with Libby Volgyes.